Posted June 9, 2016 by Christopher Harris & filed under City News. With thousands of protestors recently demonstrating against NSW Premier Mike Baird at Parliament House in Macquarie Street, it is safe to say that frustration at the State Government is at an all-time high. Issues referenced by protestors included the forced amalgamations of councils, controversial infrastructure projects, the introduction of laws restricting civil liberties, and the licensed venue lock-out laws. Whilst Baird initially had a great deal of personal popularity, voters on social media have now taken to the hashtag #CasinoMike to express their disappointment on a regular basis. 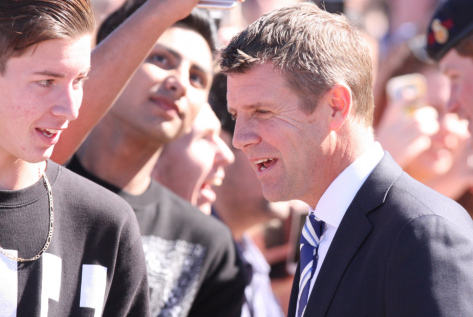 The unpopularity of recent State Government decisions should be of particular concern for Baird because it appears to extend across the political divide, including to voters that the Liberal party is pitching itself to most heavily. It also comes at a particularly important time for the party federally. For example, technology entrepreneur Matt Barrie has been particularly scathing of the lock-out laws. However, he appears to be just the sort of voter the Prime Minister, Malcolm Turnbull, is pitching to when he uses terms like ‘agile’ and ‘innovative’ in his election campaign. This raises questions about the effect that the Premier might have on the ability of the federal Liberal party to woo voters in New South Wales. Whilst this is always hard to quantify, there are seats that appear to be playing out state-issues at a federal level. In Kingsford Smith, Labor MP Matt Thiselthwaite has campaigned hard against the destruction of heritage trees by the light rail project. This could be an important issue in the challenge posed by Liberal candidate, Michael Feneley. In the Inner-city seats of Sydney and Grayndler, the competition between who will do a better job in opposing the agenda of the state government is a battle being fought by Labor and the Greens. Recent polling has even indicated that the Prime Minister is facing a significant negative swing in his blue ribbon seat of Wentworth. However, to have a significant detrimental impact on the federal Liberal Party’s push for re-election the Mike Baird effect must see seats change hands from the Coalition to Labor. In this respect, the effect seems marginal but not non-existent. There are two seats which are particularly noteworthy. The first is the seat of New England, held by Deputy Prime Minister, Barnaby Joyce. Forced council amalgamations have been particularly unpopular in this seat. The Independent former MP for the seat, Tony Windsor, is campaigning hard on the issue. For Tony Windsor to defeat Barnaby Joyce would be a shocking defeat for the government. However, with the resources deployed by the Nationals it will take an incredible amount of work. Likewise, in Eden-Monaro, local government issues are proving to be a major concern. Labor’s candidate is Mike Kelly, a former legal officer in the Australian Army who held the seat from 2007-2013. He will campaigning on issues such as the council amalgamations, in a bid to unseat Dr Peter Hendy, a member of the Turnbull Ministry, who holds the seat on a margin of under 1 per cent. Eden-Monaro will be a particularly interesting seat to watch. It is probably the country’s best known “bellwether seat”. Since 1972 the party that has won Eden-Monaro has gone on to form government. Regardless of whether they have a demonstrable effect on the outcome of the election, it is clear that the controversial decisions of the state government have caused some serious headaches for the Coalition at a federal level.